The discovery by the Spanish branch of Medecins Sans Frontieres follows migrant bids to storm border fences. Six died on Thursday, some apparently shot while trying to enter Melilla. A group of 70 migrants were expelled from Melilla on Friday, in the first set of official expulsions expected under a revived 1992 accord between Spain and Morocco. It allows illegal entrants to be sent back to Morocco, even if they are of different nationalities. But an MSF spokeswoman said that while some of the 500 found in the desert had been detained before they managed to cross the Ceuta and Melilla fences, others had been illegally expelled by Spanish police. MSF said the sub-Saharan migrants had been "abandoned to their fate" near El Aouina-Souatar, hundreds of kilometres south of the enclaves. The group included pregnant women and children. The agency said staff had treated more than 50 of them for injuries suffered as a result of crossing the barbed-wire fences. But the MSF statement claimed some of the injuries were also the result of violence inflicted by the Spanish and Moroccan police as "some showed bruises from being hit by rubber bullets". Javier Gabaldon, co-ordinator in Morocco, denounced the "expulsion and later abandonment of these immigrants to a zone without access to food and water and without the possibility of receiving medical or humanitarian aid". MSF said "the sending back of immigrants as agreed by Spain and Morocco to a country which does not have minimal capacity to receive them violates Article Three of the (UN) Convention against Torture". Other aid organisations said they had evidence of similar incidents in recent weeks. The UN refugee agency (UNHCR) has also raised concerns and called for joint action to tackle the crisis. 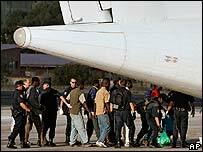 The European Union and Spain are both sending missions to Morocco to tackle the issue of illegal immigration.